Congratulations to Ukrainian-Austrailian author Lesa Melnyczuk, PhD for being the 2018 The Independent Publisher Book Award (the “IPPYs”) gold medal recipient for her book Holodomor: Silenced Voices of the Starved Children in the European region, non-fiction category. A collection of forty stories told from first-hand experiences of the Ukrainian terror-famine of 1932-33 by survivors who later migrated to Western Australia, Holodomor: Silenced Voices of the Starved Children is edited by Lesa Melnyczuk-Morgan, PhD and Philip Webster, and published by Carina Hoang Communications (Subiago, Western Australia). Soyuz Ukrainok Ameryky – The Ukrainian National Women’s League of America announcing the launch of their new website on Monday, April 15th. The website features a history of the organization, news articles and all of the projects in which they are engaged in the sphere of social welfare, culture and education. «Human with a Stool» – an adventure documentary film about the last trip of a traveler and director Leonid Kanter. In 2004, in the casual Kyiv apartment, a group of film students came up with a simple but insane adventure «With a stool to the ocean»: to bring four wooden stools to the shores of four oceans. The film documents the final, fourth trip to the Pacific Ocean, which lasted a year. Leonid recorded everything that surrounded him, and turned his life into cinema. Having returned to Ukraine travelers were met with war. The documentary «Human with a Stool» should have been a manifesto for eternally strong human dreams and its powerful actions toward them. However, life itself changed the scenario. Conductor Mykola Hobdych and the world-renowned Kyiv Chamber Choir return to North America in May of 2019, for concerts in high quality musical venues in both the United States and Canada. They will perform in New York, Chicago, Washington, Philadelphia, Boston, Cleveland, Hartford, Detroit and Rochester as well as in Toronto. Today we celebrate the life and art of Lesya Ukrainka who was the foremost woman writer in Ukrainian literature and a leading figure in its modernist movement. She was also known as an activist for the advancement of political, civil and women’s rights. 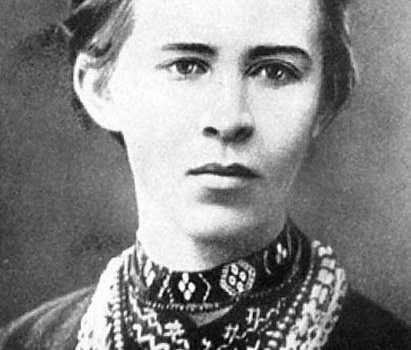 The daughter of intellectuals, Lesya Ukrainka had a number of influential people to mentor her from a young age. Her mother, Olha Drahomanova-Kosach, was better known by her penname Olena Pchilka, and was a publisher, writer, interpreter and civil activist, and her mother’s brother (Lesya’s uncle) was renowned scientist, philosopher, historian and public figure, Mykhaylo Drahomanov. Lesya’s father, Petro Kosach, was a strong advocate for the progress of Ukrainian culture, providing financial support for publishing Ukrainian literature. Her brother, Mykhaylo, also gained recognition in the literary world where he was known by the penname of Mykhaylo Obachny. The Ukrainian Institute of America offers a Ukrainian Language course with classes for both beginners and people with advanced knowledge. The courses last for 10 weeks and take place in spring and fall. This spring, Intermediate students will meet on Tuesdays from March 5, and beginners on Wednesdays from March 6. The cost is $350.00 for 10 weeks. If you are interested, please email us at info@ukrainianinstitute.org or call 212-288-8660. 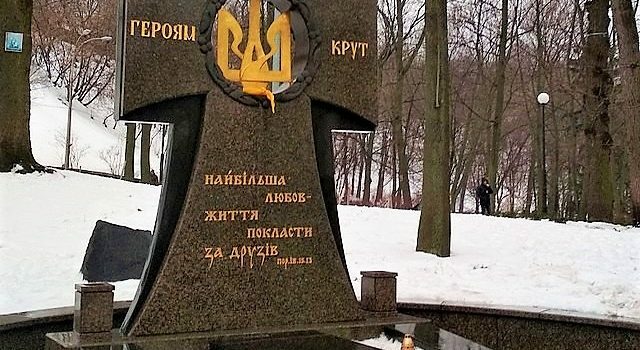 The battle took place on January 29, 1918, when several hundred men of the Ukrainian forces including 300 students briefly halted the advance of 4,000 soldiers of the Red Army towards Kyiv. Today, November 24, 2018, marks the Holodomor Remembrance Day and the 85th anniversary of the Holodomor. Since 2006 it takes place every year on the fourth Saturday of November. On this day people in Ukraine and all over the world are lighting candles in memory of those killed during the genocide of 1932-33.